Tuesday 19th March was the last Area Band for the spring term but Area band rehearsals will be back in the summer, with the first date being the 23rd April and running through until 25th June. An end of year showcase will be held on either the 1st or 2nd July. A huge well done to all the children who attended the Area Band concert to parents yesterday on the 12.3.19 at Bulwell academy. You did yourselves and the school proud. They performed 3 pieces they have been working on all term and from the feedback I have got from parents so far they were incredibly proud and impressed. What a busy term for Area Band! They have learnt 4 new pieces and worked really hard in weekly rehearsals all for the Christmas in the City event which was held on he 12th December at the Royal Concert Hall. 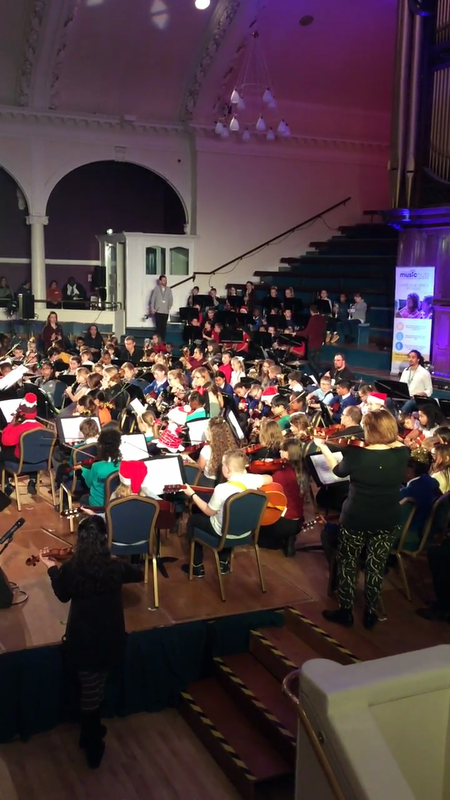 They performed Carmina Burana, The Ghostbusters theme and Justin Timberlake's 'Can't stop the feeling' to an audience of nearly 1000 people, including the Lord Major of Nottingham. Miss Sharpe our Music Lead is in charge of Area Band. It will continue to take place on a Tuesday evening after school. Details from Miss Sharpe to follow shortly! 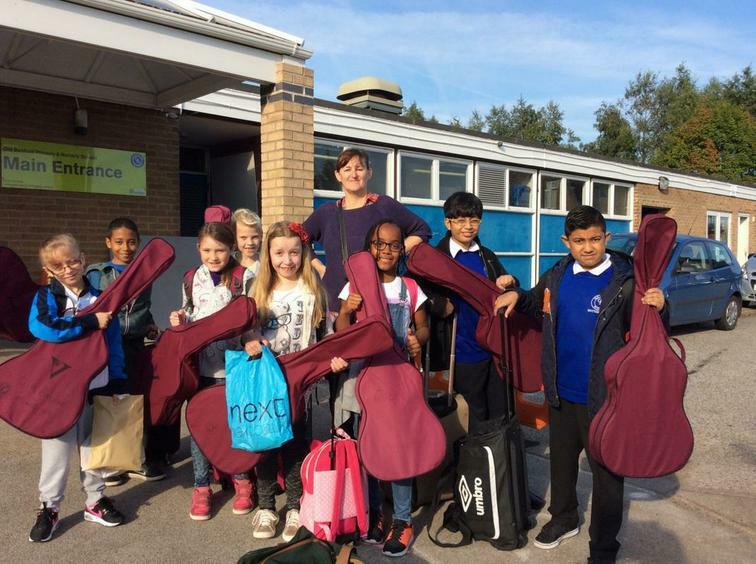 AREA BAND IS A FOLLOW ON OPPORTUNITY FOR YEAR 5 & 6 CHILDREN WHO STARTED TO LEARN TO PLAY THE GUITAR IN YEAR 4 AND FOR A SELECT FEW WHO HAD THE CHANCE TO ATTEND BAND CAMP AT THE START OF THE SCHOOL ACADEMIC YEAR. AREA BAND RUNS THROUGHOUT THE YEAR. PRACTICE SESSIONS OCCURRING ON A TUESDAY AFTER SCHOOL AT ROBIN HOOD PRIMARY. THERE IS A COACH PROVIDED TO TAKE AND BRING THE CHILDREN BACK. THE CHILDREN ARE SUPERVISED BY A MEMBER OF SCHOOL STAFF AT ALL TIME, WHILST MUSIC PRACTITIONERS FROM NOTTINGHAM MUSIC SERVICES OFFER THEM THEIR EXPERTISE - PLEASE SEE THE LINK AT THE BOTTOM OF THE PAGE FOR EXACT DATES. EACH YEAR, AREA BAND MEMBERS HAVE THE OPPORTUNITY TO SHOWCASE THEIR TALENT BY PERFORMING IN HIGH PROFILE CONCERTS/VENUES THROUGHOUT THE CITY, SUCH AS ‘ XMAS IN THE CITY’ AT EITHER THE ROYAL CONCERT HALL OR THE ALBERT HALL, AND ‘LIGHT NIGHTS’ AT ST PETERS CHURCH IN THE CITY CENTRE. As a celebration of all the efforts, successes and musical talents that have been nurtured in school this year Area band attendees along with other musicians from Old Basford they will be demonstrating their talents to family, friends and KS2 on the 15th June in the afternoon (time to be confirmed). Please come along to help celebrate your child's achievements. Area band will also be performing at the Albert Hall to family and friends on the 27th June alongside the Robin Hood intermediate band to showcase the culmination of this years hard work. This means the last rehearsal of the year is the 26/6/18. The last Area Band practice for this term was on the 28/11/17. Area band will start back up on the 9/1/18 in the new year, but of course we still have the Christmas in the City showcase to look forward to on the 4/12/17. Hope to see you all there. The Year 5/6 children who play in the North Nottingham Area Band were exceptional on Monday night at the Albert Hall. They played 3 songs, alongside the other instrumentalists in the band and absolutely shone in their professionalism and ability to play their instruments. They did Old Basford and themselves proud. I am sure all the parents who came to watch were also extremely proud. Area Band will be performing on Monday 4th December at the Albert Hall in Nottingham. The concert will start at 7.00pm and end at approximately 9.30pm. AREA STARTED BACK ON THE 12TH OF SEPTEMBER AND HAS GOT OFF TO A FLYING START. 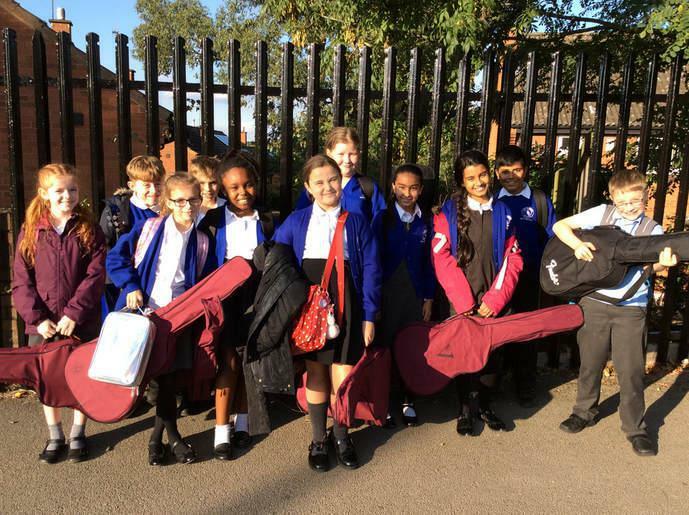 THERE A CURRENTLY 12 MEMBERS FROM OLD BASFORD ATTENDING AND THEY ARE STARTING TO LEARN THE SONGS THEY WILL BE PERFORMING AT THE CHRISTMAS SHOW IN THE CITY LATER THIS YEAR. Hard at work with the other schools getting to know the songs they will be performing. In September Miss Sharpe takes a small group of year 5 children on a two day music residential to Ilam Hall in Derbyshire. 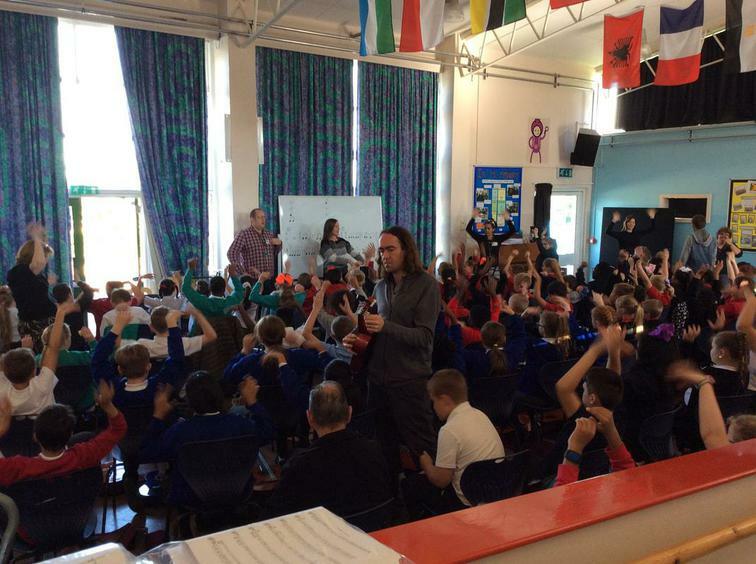 It is run by Nottingham Music Services who provide the music provision in school and supported by school staff. Miss Sharpe and the 8 lucky children ready and waiting for the bus to go to Ilam Hall. Other Primary schools from the local area also send groups of children, with as many as 100 plus children being in attendance. It is a fun packed couple of days where the children get to build on the instrument skills that they have acquired in year 4 and learn new skills related to music that will help them going forward to progress in playing their instruments during years 5 & 6 and as members of the North Nottm Area Band. Whilst there the children learn about musical notation, how to decode and read scores of music, as well as learning two pieces of music from scratch, that they perform with the other children from surrounding schools.